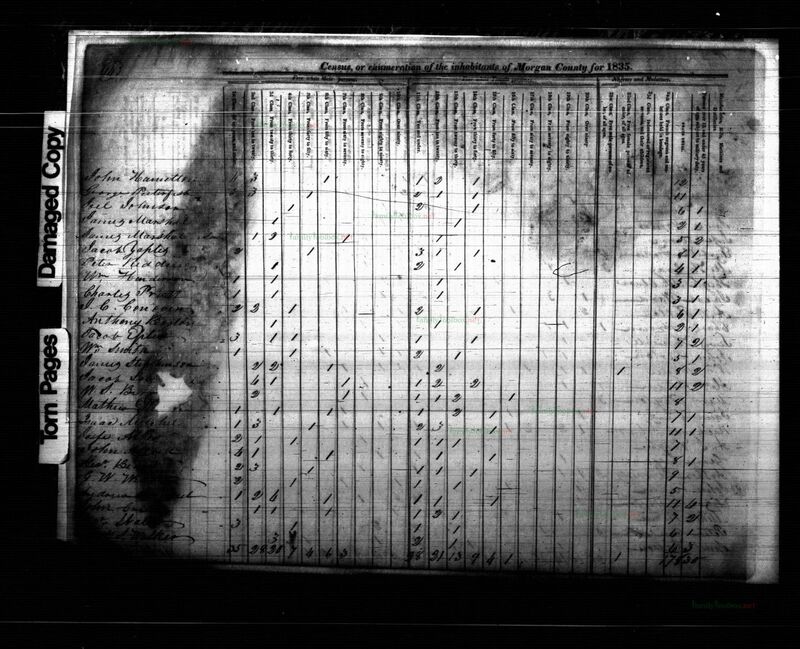 This is a rare image of a ledger page of the 1835 Illinois state census from Morgan County, Illinois. 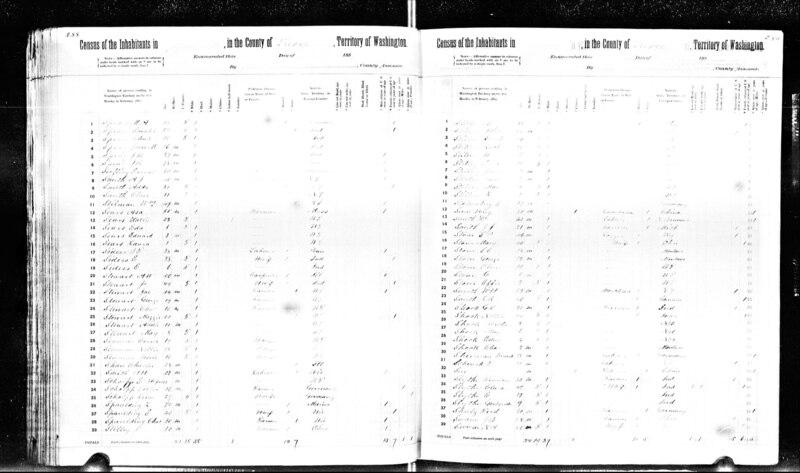 John and Altha Hamilton were in Morgan County in 1834 when their twins were born; William McCord and James M. Hamilton. 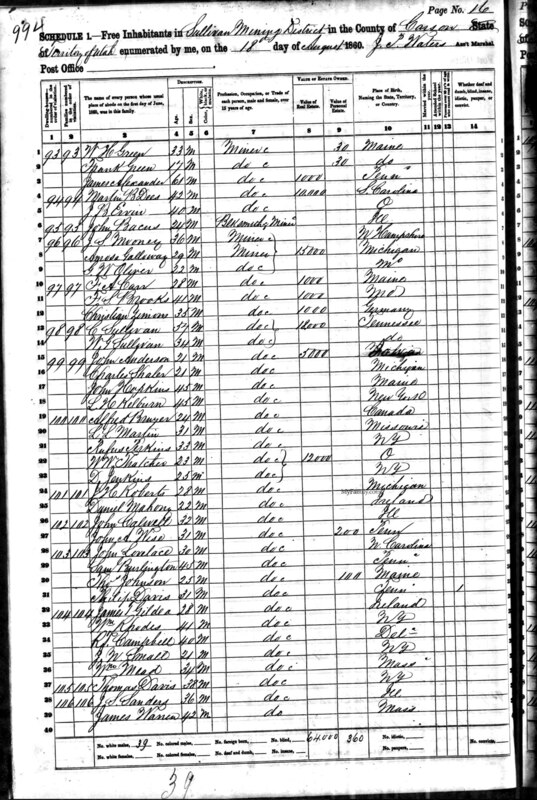 I looked at every page of the census and feel confident that the entry at the top of this page is for "our" John Hamilton... Supplina's father along with his mother Altha Judd. The case is strengthened when you look closely at the make up of those in the household. 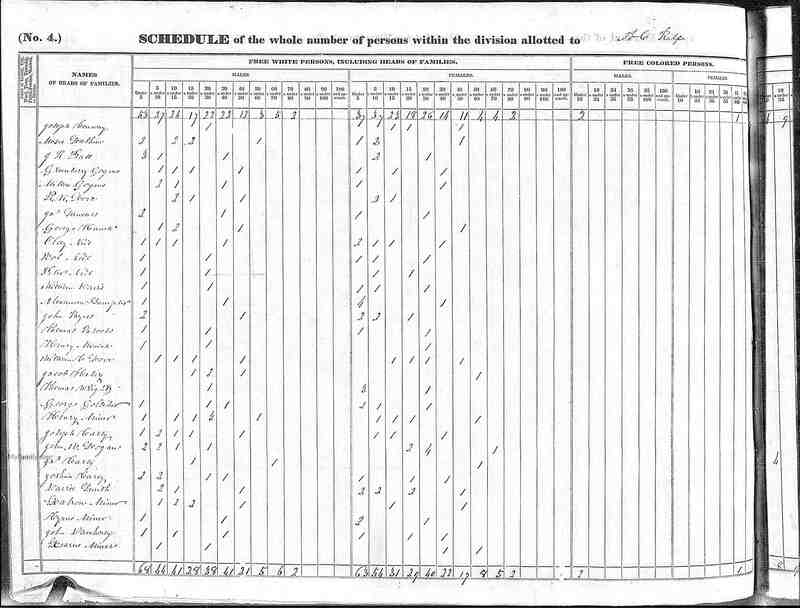 There were four boys under ten: William (1), James (1), Supplina (3) and John P. (6). There were three boys between ten and twenty: Heman, Hiram, and an unknown male. One man between fifty and sixty: John (approx 55). There was one female under ten: Mary (8). There were two females between ten and twenty: Roxa (Roxie) and Elizabeth. There was one woman between thiry and forty: Altha (Judd) Hamilton (approx. 38). 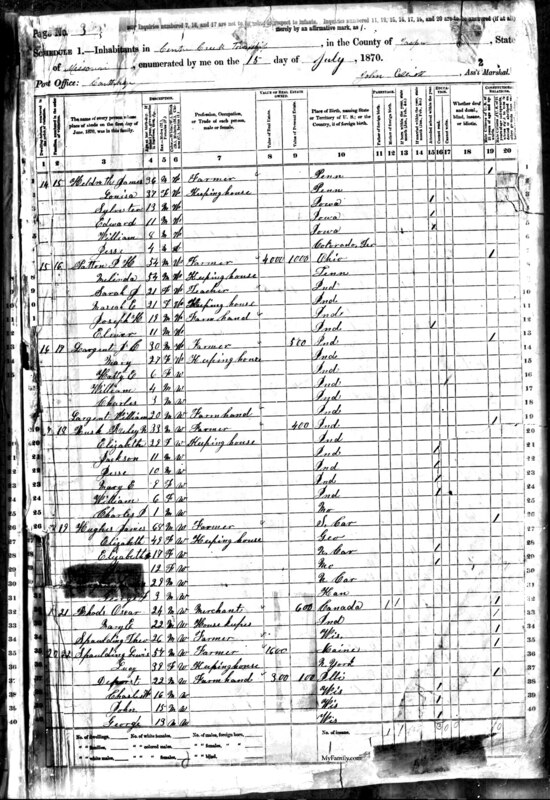 The unknown male in the ten to twenty age group also appears in the 1830 US Census (but appropriately younger) when the Hamilton's where in in Amity district, Allegany County, NY. 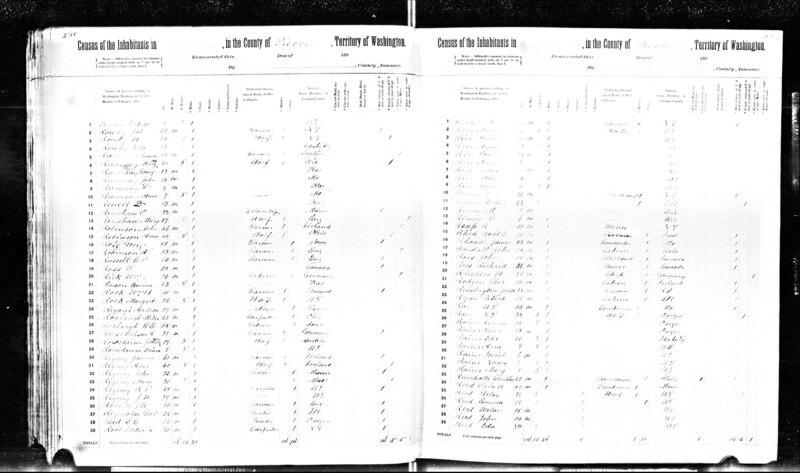 In the 1830 US Census in NY our John Hamilton family was living next to Supplina Judd and Heman Judd. 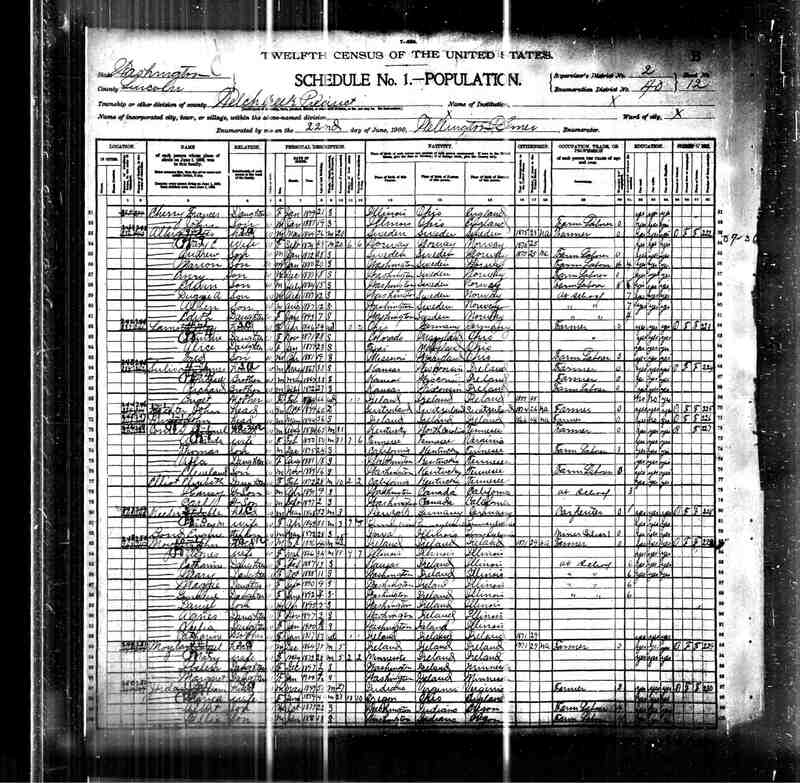 So, now we've established the 1830 census record for John and Altha in NY and the 1835 census record in Illinois and in both cases there is a young male household member who we (I) currently do not have a name for. 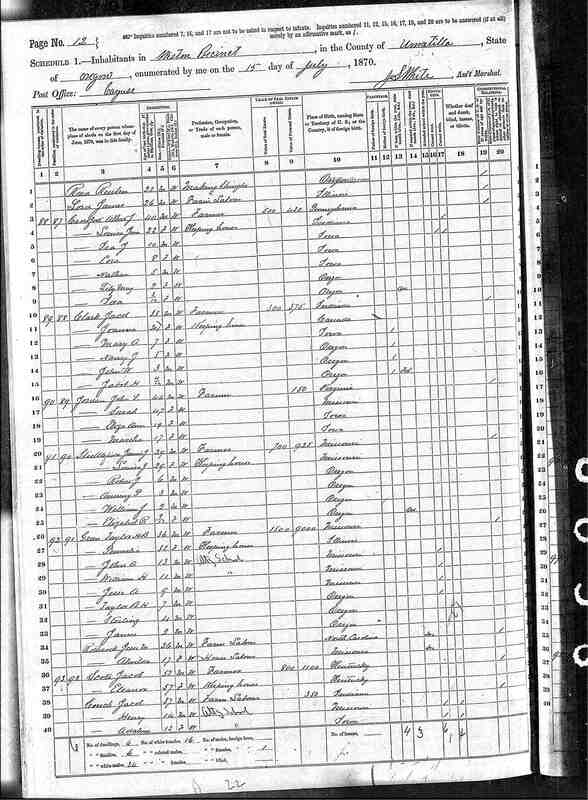 Alexander and Nancy (Prather) Sumpter lived in Missouri before walking the Oregon Trail west to Oregon in 1853. 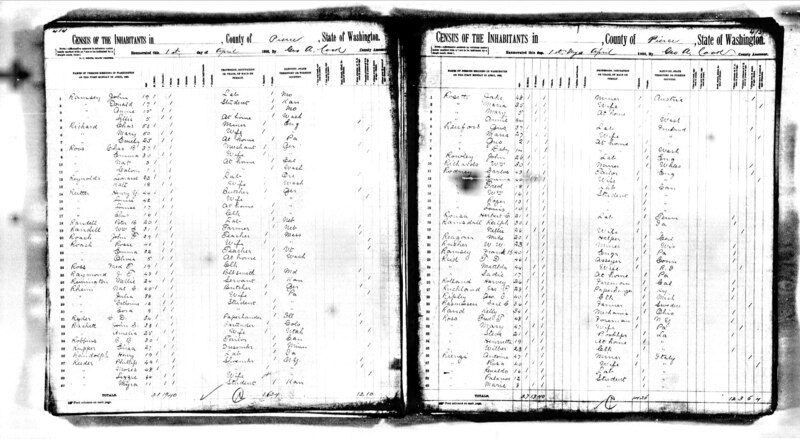 One of their daughters, Sarah Jane became the wife of Supplina Hamilton in Linn County, Oregon in 1858. 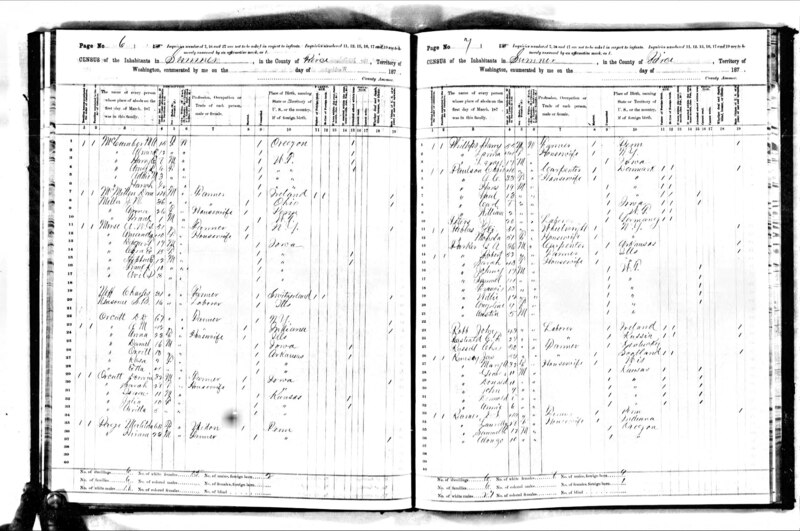 Here's the census record of the amazing family of Alexander Sumpter and Nancy Prather in 1850. Alexander was the father of eight girls. Their ninth child would be a son, Alexander, Jr. who was carried by Nancy as she walked the Oregon Trail in 1853. Alexander was born shortly after they arrived in Oregon. 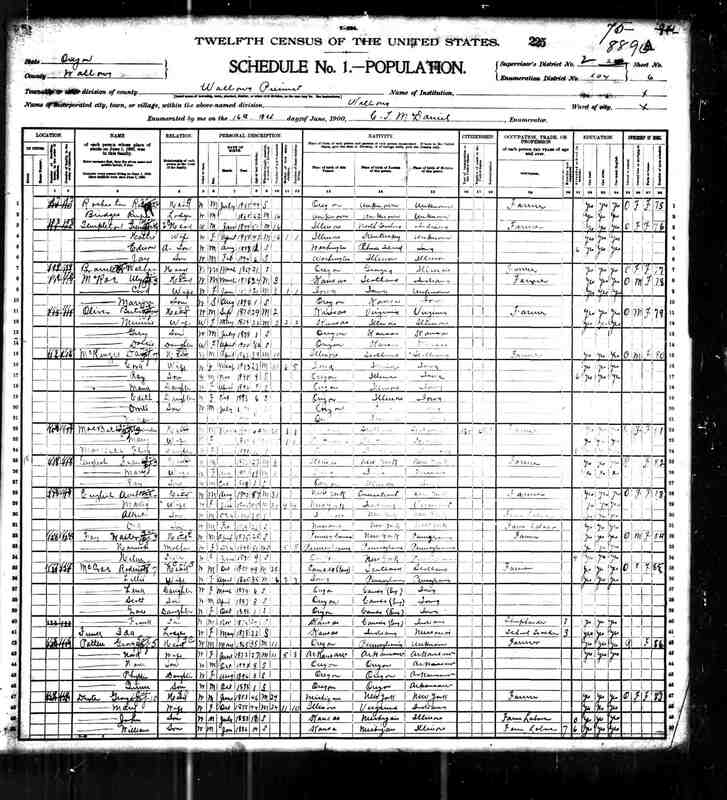 Among all those girls was Nancy Jane Sumpter who would be the wife of Supplina Hamilton, married in Linn County, Oregon in 1858. 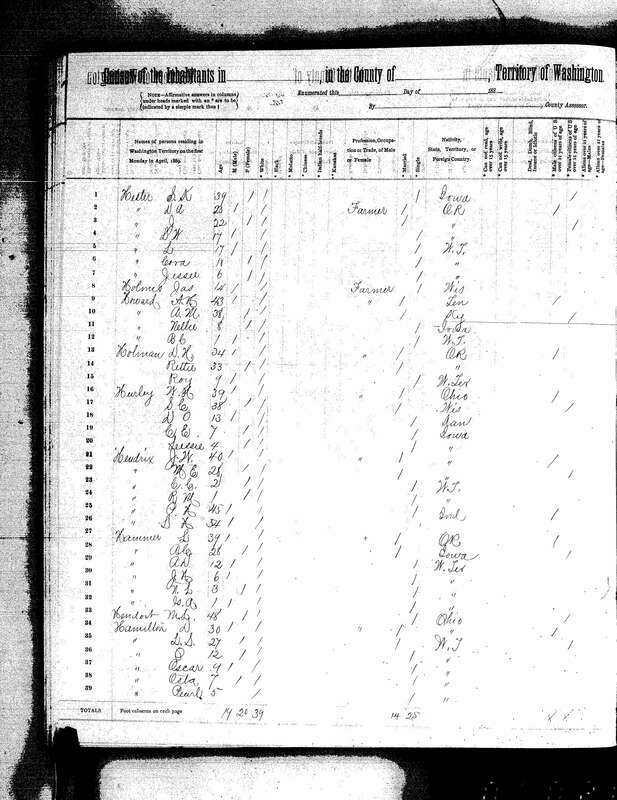 1850 US Census record for William and Rachel McCarty and family. 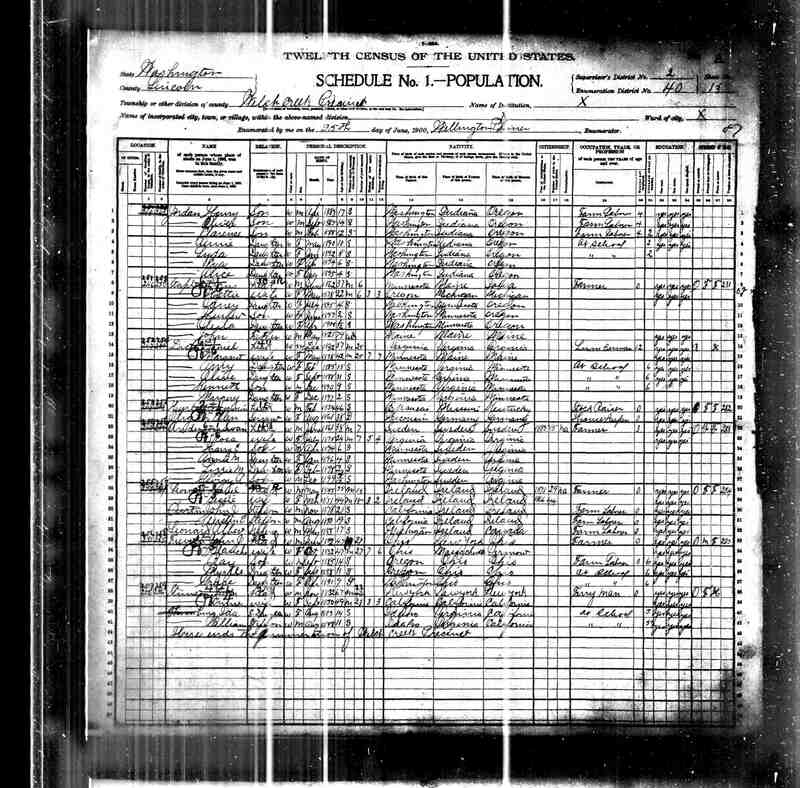 William (page 1) was a 32 year old Brickman born in Indiana. His wife (page 2) Rachel was 25. They had a son, Thomas at 6 years old and a baby, Nancy J (Jane) who was 1 year old. Nancy would grow up and marry Greenberry Shields Templeton in Windsor, Shelby County, Illinois and become the mother of Laura Annettie (Hamilton) Templeton and Julia Aletha (Hamilton) Templeton. 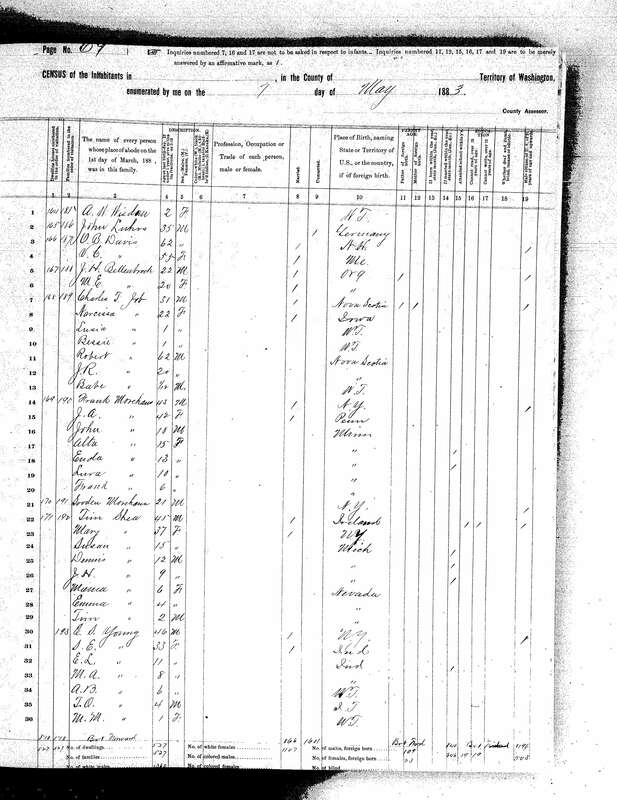 1850 US Census record for William and Rachel McCarty and family. William was a 32 year old Brickman born in Indiana. His wife (page 2) Rachel was 25. They had a son, Thomas at 6 years old and a baby, Nancy J (Jane) who was 1 year old. Nancy would grow up and marry Greenberry Shields Templeton in Windsor, Shelby County, Illinois and become the mother of Laura Annettie (Hamilton) Templeton and Julia Aletha (Hamilton) Templeton. William McCord Hamilton was the son of John and Altha (Judd) Hamilton. He is 26 in 1860 and working as a farm laborer on the Weadon farm outside of Mason City, Illinois. His twin brother James is working on a farm nearby. They will both enlist in the army together in 1862. 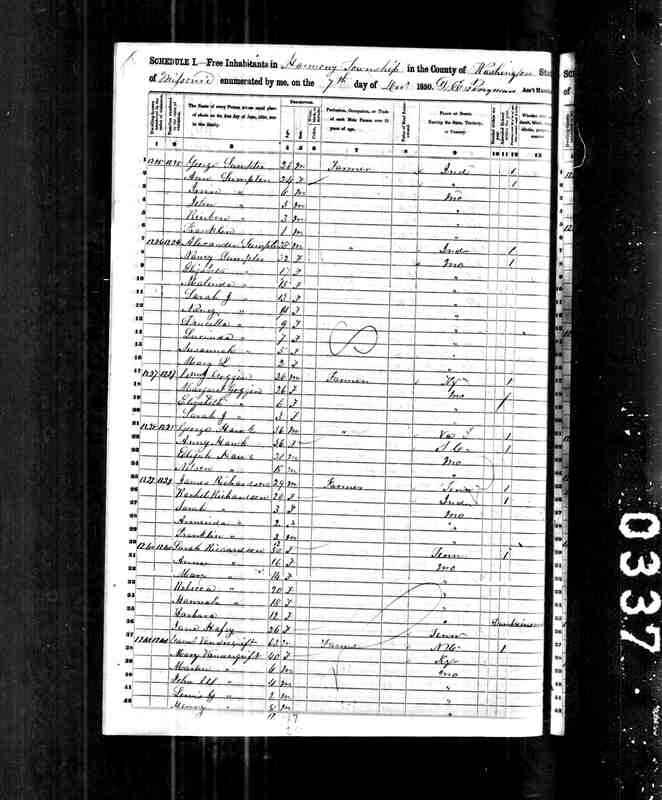 This is my, so far, my earliest census record for Amasa Galloway. Amasa is living in the Sullivan Mining District in what is now the state of Nevada. He and his two partners are mining a claim they valued at $15,000. 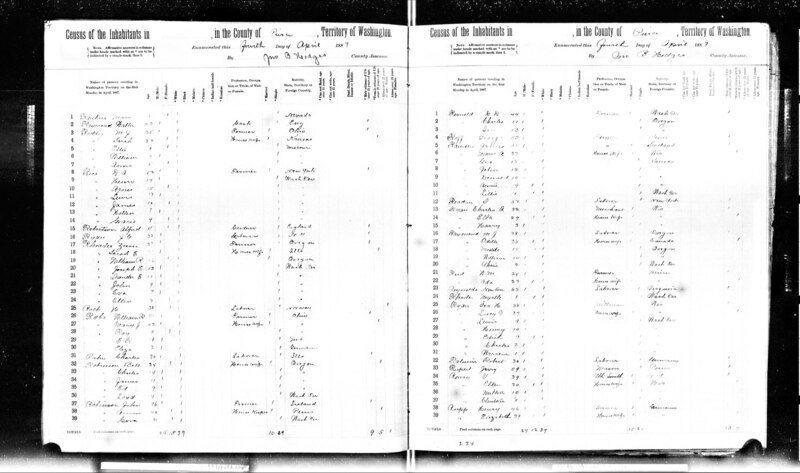 There were 39 people listed as living in "Sullivan's Mining District" in 1860. Carson County, Utah Territory was split off as Nevada Territory in 1861 and then was admitted to the Union as the State of Nevada in 1864. Amasa was 29 in 1860 and (I assume) single. 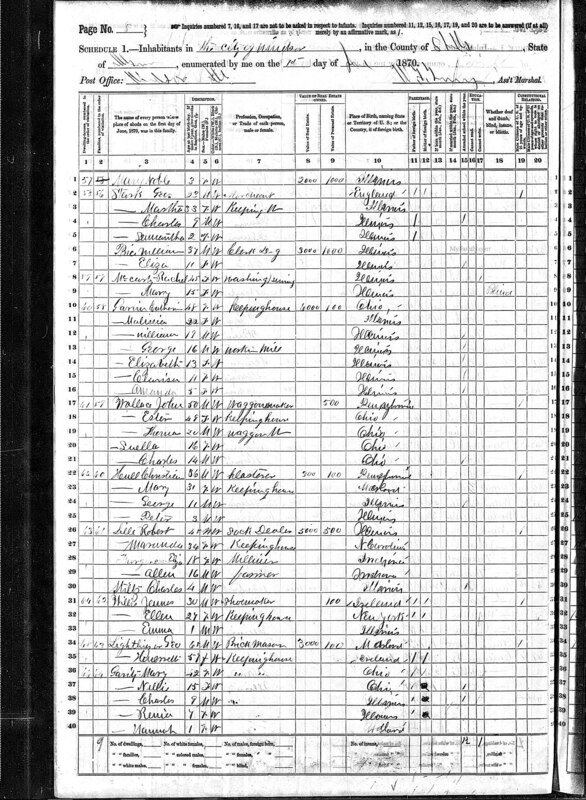 We later find him in 1870 living near Seattle in King County, WA married to Elizabeth Jordan. He is found in Walla Walla County, WA in the late 1870's and early 1880's. He had a couple lawsuits filed against him there for the collection of promissory notes. He later moved to Whitman County, WA in the 1880's. 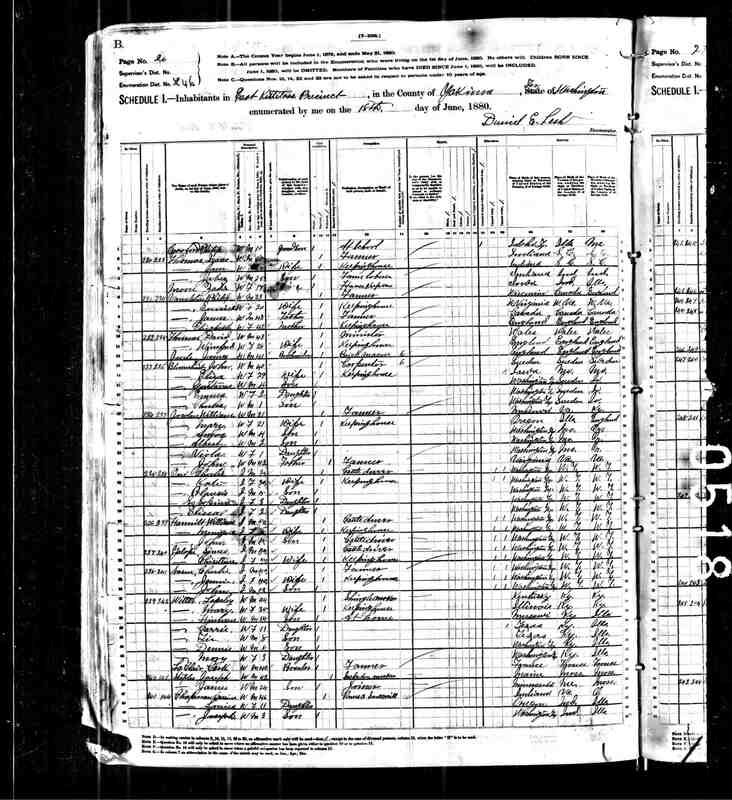 We find him and his wife Elizabeth Jordan and family living in the Wauconda mining district in Okanogan County, WA in the 1890's and early 20th Century. One of Amasa's younger sons was Charles Amasa Galloway. Charles was the father of Elsie (Galloway) Hamilton. 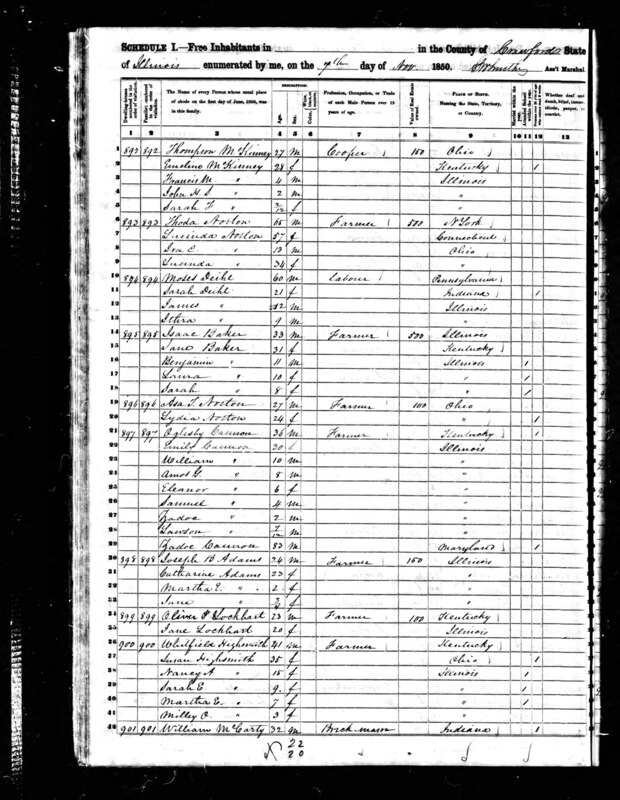 This the first page of the 1860 Census record for John and Sarah Jordan. John was born in Virginia and his family appears to have roots there back to at least the late 1600's. 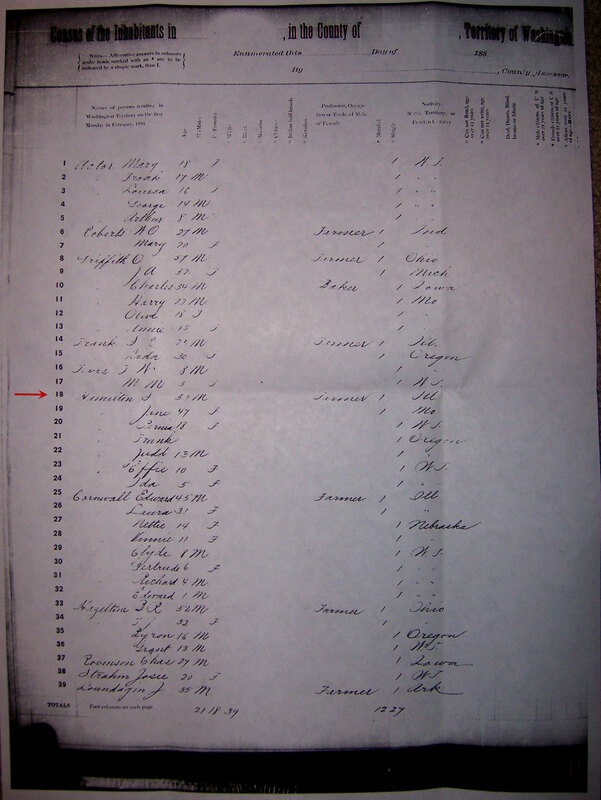 John and Mary were the parents of Elizabeth Jordan who was the mother of Charlie Galloway and the grandmother of Elsie Luetta (Hamilton) Galloway. 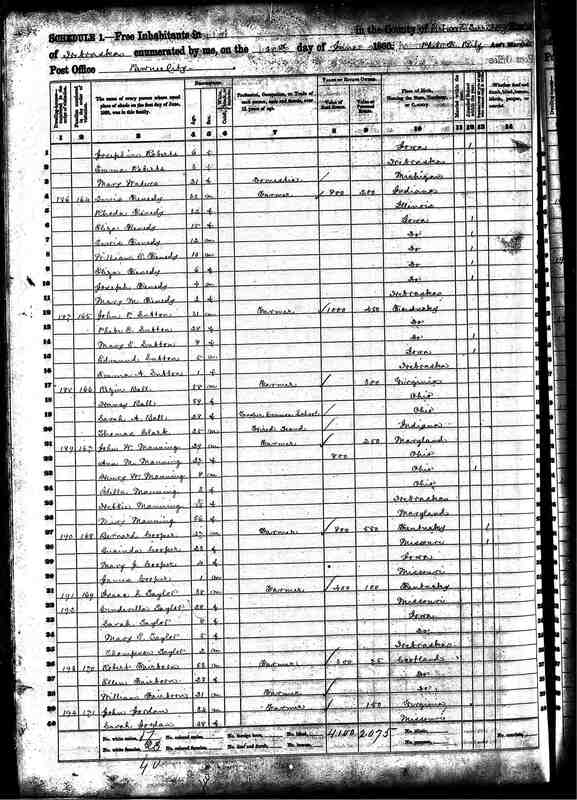 This is the second page of the census record for John and Sarah Jordan's family in Nebraska Territory. On the page are listed Elizabeth Jordan 14 and her brother William Jordan 11. Elizabeth would marry Amasa Galloway and become the mother of Charlie Galloway and the grandmother of Elsie Luetta (Hamilton) Galloway. William would become the father of Oliver and Clarence Jordan who would strike gold in 1932 in Washington State. 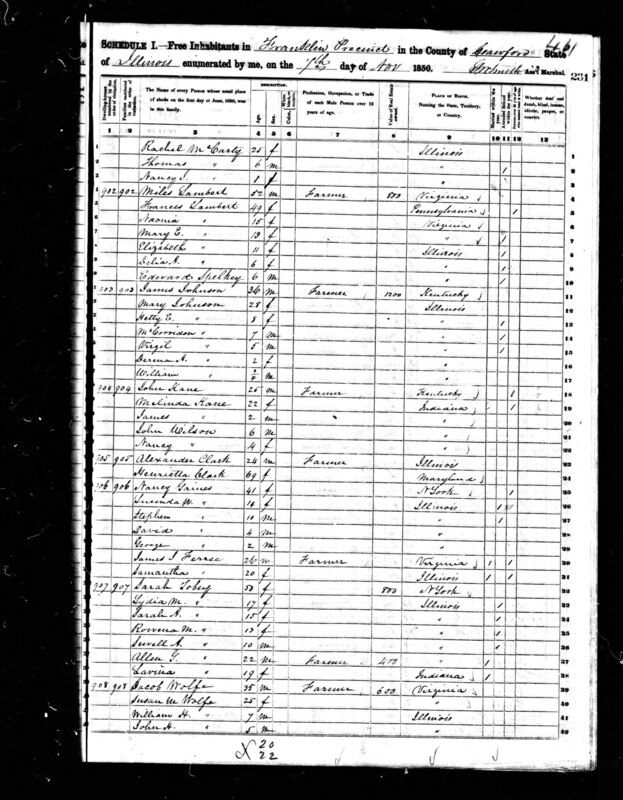 John and Sarah Jordan were the parents of Elizabeth Jordan who became the wife of Amasa Galloway, the mother of Charlie Galloway and the grandmother of Elsie Luetta (Hamilton) Galloway. 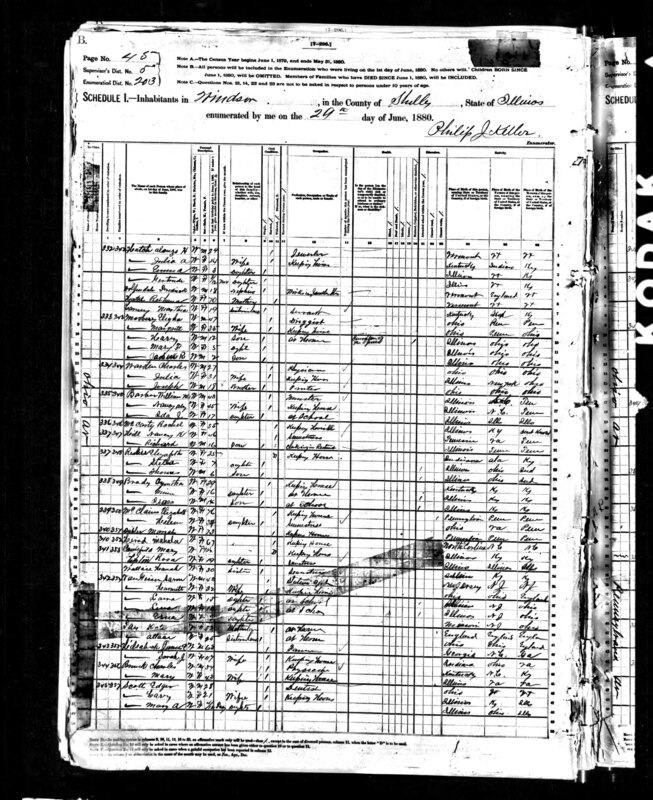 1870 US Census Record for Rachel McCarty, Windsor, Shelby County, Illinois. Rachel was the mother of Nancy Jane McCarty who was the first wife of Greenberry Shields Templeton and the grandmother of Laura Annettie (Hamilton) Templeton and Julia Aletha (Hamilton) Templeton. Rachel was a 45 year old widow living in town, her occupation was 'washing and sewing.' Living with Rachel was her 15 year old blind daughter Mary. James and Mary A. 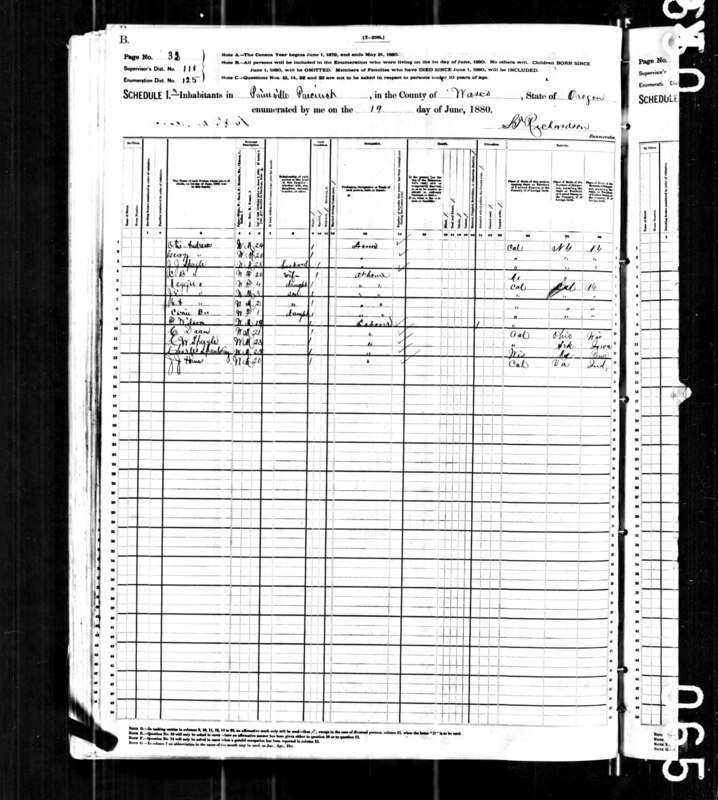 (Spaulding) Ramsay were the parents of Lillian Mae (Galloway / Fee) Ramsay and the grandparents of Elsie Luetta (Galloway) Hamilton. 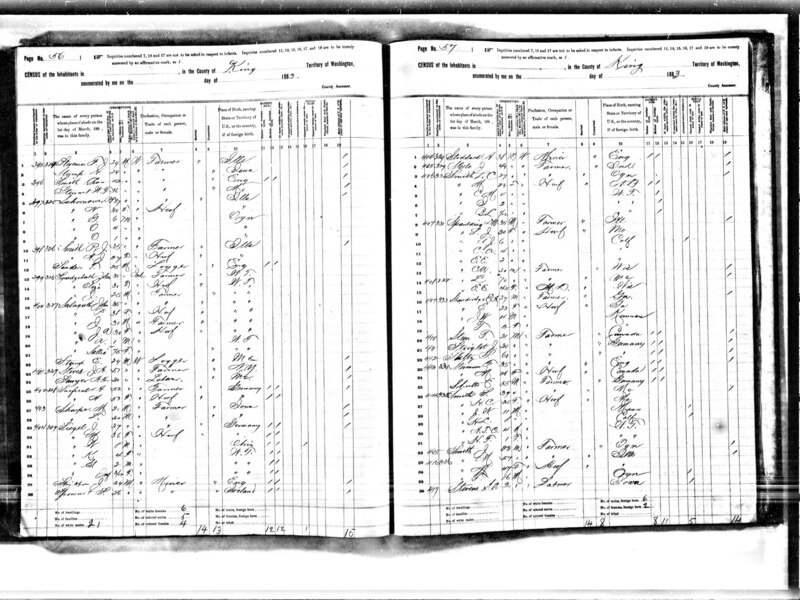 Here are William and Mary Jordan and their family near Yakima in 1880. William widowed father, John is living with them. William was a brother to Elizabeth Jordan the wife of Amasa Galloway, the mother of Charlie Galloway and the grandmother of Elsie Luetta (Hamilton) Galloway. Duron Hamilton was the eldest son of Supplina Hamilton. 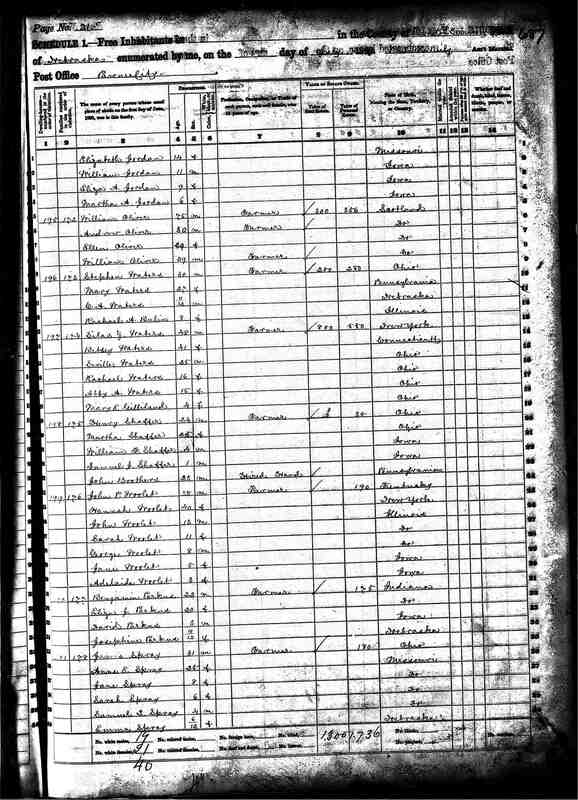 This is the second page of the 1900 U.S. Census record of William and Mary Jordan and family. 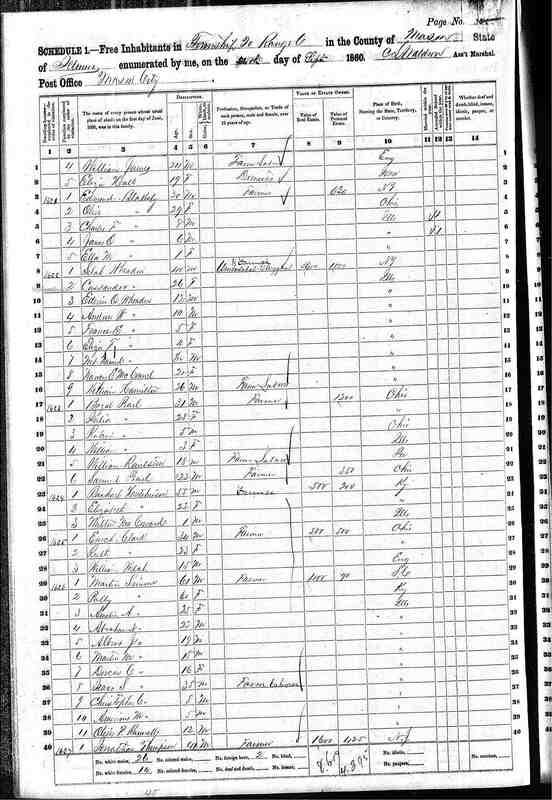 On this page are listed their two sons, Oliver "Ollie" and Clarence who would in 1932 make one of the richest gold strikes in Washington State near Liberty, Flag Mountain near Blewett Pass. 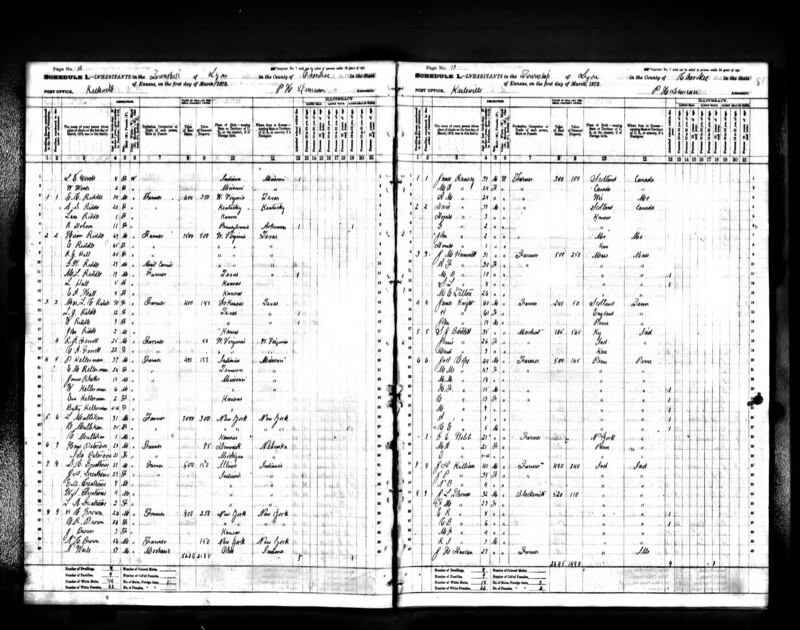 This is the first page of the 1900 US Census record for the William and Mary Jordan family. William Jordan was the son of John and Sarah Jordan and the younger brother of Elizabeth Jordan. Elizabeth would marry Amasa Galloway and become the mother of Charlie Galloway and the grandmother of Elsie Luetta (Hamilton) Galloway.